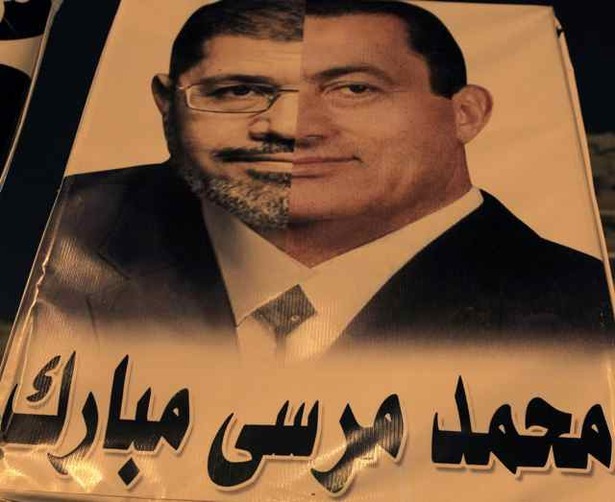 The putsch was the result of widespread opposition to Morsi, his autocratic attitudes but more important was the widespread perception, including from some who voted for him, that he and the Brotherhood were incompetent. 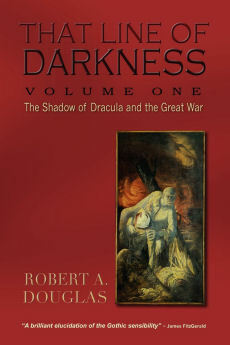 They were perceived as being more concerned about consolidating their power base and vilifying those who opposed them as infidels rather than bringing about the necessary economic, educational and administrative changes, which include shrinking a bloated indolent bureaucracy. Their brand of politics promised no separation of politics and religion, hence the impossibility of pluralism, and a hostility to modernity that guaranteed economic incompetence. George Will's judgement is too harsh: "Theologized politics, wherein compromise is apostasy, points toward George Orwell’s vision of totalitarianism — 'a boot stamping on a human face — forever. 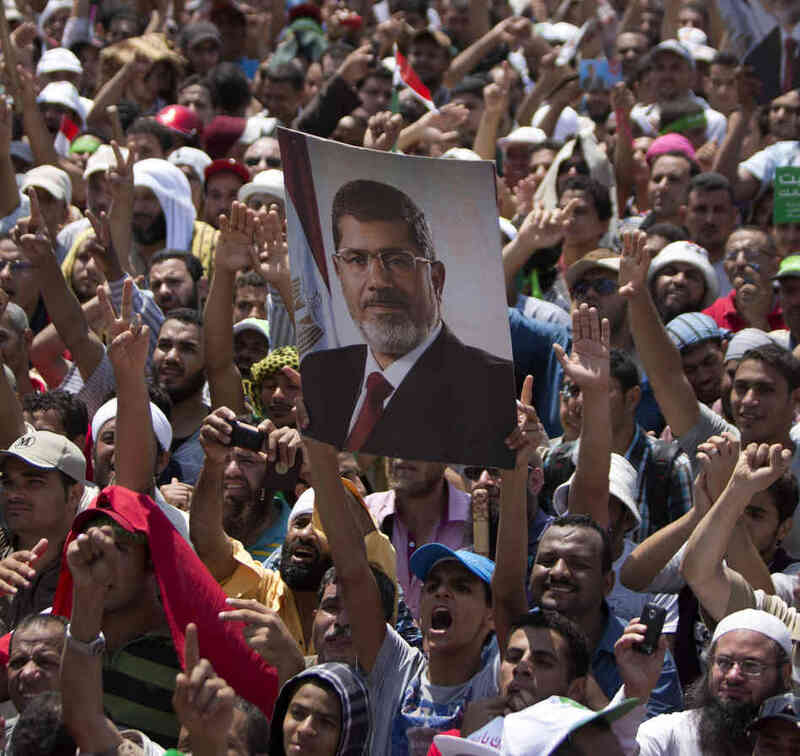 '” There is little evidence that Morsi and the Brotherhood were turning Egypt into a theocratic Iran. That theocracy would not have maintained a peace treaty with Israel, cracked down hard on terrorists in the Sinai peninsula, and taken an unexpectedly hard line against Hamas in neighboring Gaza. The Morsi style of Islamist authoritarianism seems more like the mirror image of Egypt under Mubarak. 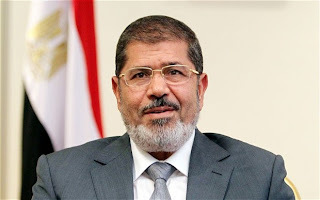 Despite international pressure that included the Obama administration, Morsi refused to bring into his government opposition members or even treat them with respect. The defining blunder of his one-year presidency occurred after Mubarak-appointed judges dissolved the Islamist-led Parliament when Morsi in November, without consulting his Brotherhood allies, declared his own authority above the courts until a constitutional convention could finish its work. Political grandiosity alone would not have driven unprecedented numbers into the streets mobilized by the new alliance of youthful activists and Mubarak era elites to demand his resignation. The absence of water, electricity and cooking gas for hours every day diminished his support among those who were primarily concerned with stability and their family welfare. 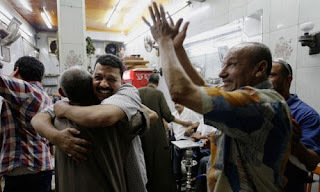 As unemployment, inflation and poverty soared that resulted from vanishing tourism, a withdrawal of investment and the decline in foreign currency, the collapsing economy was in much worse shape than it had been when Mubarak was forced to resign two years ago. The best way for Egypt to quickly earn foreign currency to buy food and fuel to end the electricity shortages would be to revive tourism, which accounts for ten percent of the economy. Yet on June 16, Morsi appointed as governor in Luxor, the heart of Egypt’s tourism industry, Adel al-Khayyat, a member of the Islamist militant group which had claimed responsibility for the massacre of fifty–eight tourists in Luxor in 1997— precisely to destroy tourism and hurt Hosni Mubarak’s government. Morsi’s own minister of tourism resigned in protest at the appointment. winning about forty-seven percent in the parliamentary election. Does this mean that democracy and Islamist governments are incompatible? 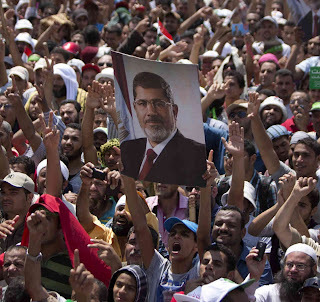 Would it have been better to wait three more years and for an election to repudiate Morsi and the Muslim Brotherhood, which has waited since 1928 to acquire the fruits of power, rather than turn them into political martyrs who could claim that they are victims driven out by infidels? 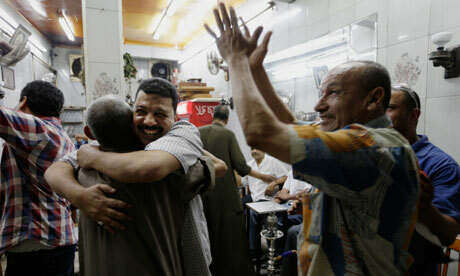 Would Egypt’s problems have become unsolvable by 2016? These are tough questions and at this time only a few tentative observations can be offered. Democracy means more than elections. Majoritarian rule is not democratic if governments do not protect rights, especially minority rights. Morsi made no effort to neither protect the rights of Coptic Christians, women from sexual assault nor the Shiite minorities. That said, the detaining of scores of Brotherhood leaders, the warrant for the arrest of hundreds of others and the closing down of the Islamist media smack of the actions of a police state—and confirm the worst fears of the Brotherhood, that they are the victims of a Western plot. It remains defiant convinced that it was robbed of the political gains it secured electorally and that a dictatorship, which has long oppressed its members, is about to be reinstated. 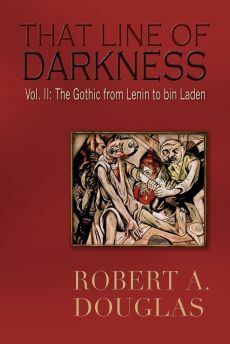 History suggests that there is an element of truth in its assessment and that a backlash could take place given that strongmen since Nasser have attempted to either destroy the movement or leave it enough wiggle room to hold up as a bogeyman to those who clamored for free elections. Some Islamists believe that democracy is futile in world dominated by Western powers and their client states, notably Saudi Arabia. They could be driven to violence, already recommended by the leaders of al-Shabaab, the Somali militant Islamist group, who believe that change only comes from the bullet not the ballot. Regrettably, the Brotherhood only has to look at recent history and see how well Islamism and democracy have fared. In 1991 the Algerian Islamist party won a landslide victory in the first round but before the second could be held, the military dismissed the President and cancelled the election leading to a catastrophic civil war which left more than a hundred thousand people dead. In Palestine Hamas won the territory’s first free election victory in 2006 but Israel and the U.S. failed to deal with it. Western countries have difficulty in accepting an Islamist government. The one exception may be Turkey where for the last ten years, its Prime Minister, Recep Tayyip Erdogan, has pursued market- driven capitalism and a socially-conservative agenda. Even though Erdogan has encountered recent stormy, even violent protests, from activists who oppose his autocratic style, attempts to restrict free expression, to demolish a major park in Istanbul and convert it into a mall, and to encroach on Turkey's secularism, his government has solid support among the rural population. And unlike Egypt, Turkey remains an economic powerhouse. Most observers believe that Egypt would continue to deteriorate had Morsi allowed to continue his presidency for three more years. With a $8 billion bailout from Qatar, Egypt would have fallen into bankruptcy. But it is troubling that a president can be unseated if the crowds take to the streets and demand his removal. What is the alternative? 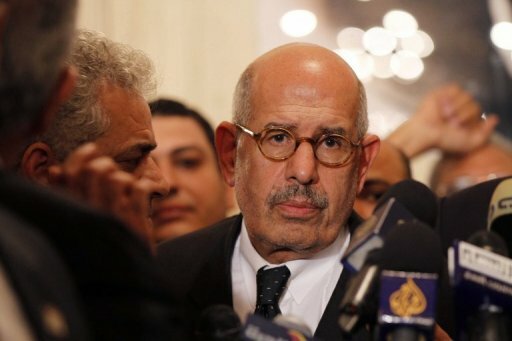 Initial reports indicated that Mohamed ElBaradei, who heads the National Salvation Front, was offered the position of Prime Minister but the offer was withdrawn when the Al Nour Islamist Party refused to work with a secular liberal. Increasing violence toward Brotherhood members, who refuse to enter into a new government, accompanied by irreconcilable narratives—Brotherhood members were shot in cold blood, the Army was provoked and each vilifying the other—the end of chaos in Egypt, the prospects for normality and the stability of the region are uncertain.Whatever happens one condition is certain: anyone who tries to govern Egypt alone will fail whether it be the army, the Islamists, the liberals. As George Packer notes, the culture in Egypt and throughout the region of zero-sum game, winner-take-a-all will need to change to one of inclusion and consensus. Egypt is in a terrible deep hole and the only way it can get out is with a national unity government that can make the structural changes that are needed. Currently, the Army is in charge and the kingmaker of whoever governs it. Whatever short terms gains that are achieved, if the schism between the secularists and the Islamists is not abridged, the furies that devastated Lebanon, Iraq and Syria will engulf Egypt. An article that appeared in the Washington Post by Ahmed Maher, an Egyptian activist who supported the coup against Morsi, warns about the power of the Army to restrict human rights and expand restrictive measures in the name of fighting the war on terror threatens to undermine the gains achieved with the removal of Mubarak. Charles Krauthammer on August 23, 2013 offers a bleak assessment of the current binary struggle between the military and the Brotherhood where a democratic alternative is not an option at this time. David Remnick in The New Yorker offers a more nuanced perspective with a historical perspective by suggesting that once an absolutist state collapses, the democratic transition takes years even decades. There are terrible events occurring in Egypt and the temptation is to declare the Arab Spring is over but if there is to substantive improvements in the future, the West, including the US must be willing to call a spade a spade, that "a coup is a coup, a massacre is a massacre." Excellent narrative of the situation in Egypt. The title is bang-on. The saga continues, and it is a challenge to even attempt to predict the near future let alone the outcome in the medium term. Some facts do not seem to register with Canadian, and US, media. For example: the extent of changes in the Egyptian grass root population, the rising politicization and knowledge of the youth, the depth of nationalism, and the impact of the powerful cultural and arts elements of society (all of which are unique to Egypt compared to the rest of the Arab and North African world).